Recently I was interviewed by Robyn Ringgold at Raising SunRays (click here to watch), a webcast for families preparing to have children and parents of children of all ages, even grandparents welcoming their grandchildren into the world. This interview was quite an honor for me because it allowed me to showcase my Spirit Art – in particular, the drawings and interpretive readings of the energy field of precious pre-birth babies. The photo of the baby we talk about in the interview is shown here. Drawing these little ones is one of the most loving thing in the world to experience because their energy is pure love. They are far more connected to the energy of creation and the Creator than they are to their new life outside the womb. Their time in gestation, is of course, to grow and prepare to be born into a new experience of life. It takes a lot of energy for the baby to grow and mature, and a lot of energy for the baby to prepare to enter the world. From the moment of conception, the baby is picking up signals from the mother and father. As the baby grows he or she scopes out the environment they will be born into. The baby learns to recognize certain sounds, the voice of his mother, recognize her heart beat, the sounds and feel of her body, recognize the father’s voice and others that are around the mother most often. The process is magical to witness from the baby’s perspective . . . and be a tiny part of the whole process. The drawing is just a few minutes in time in the life of a gestating baby. Just like any older child or adult, the drawing and the information found in a pre-birth drawing will change a bit as the baby matures and gains more experiences. However, the information that the baby shares is very important to him/her and gives them some security that their needs will be met at birth and during their growing up years. 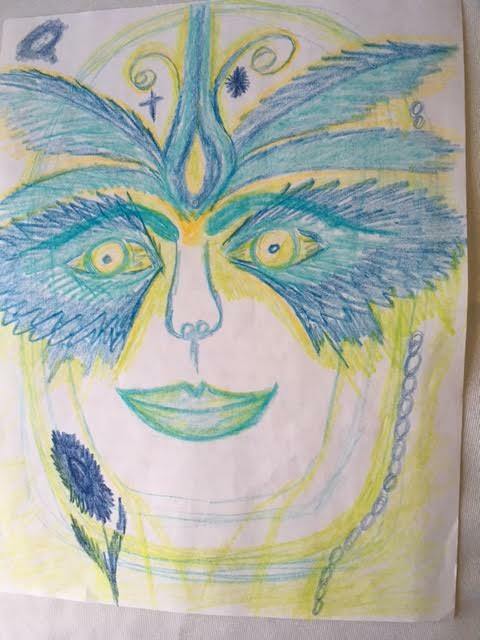 I’ve asked permission to share the reading associated with a drawing I made almost four years ago. It is amazing how accurate the reading is as it relates to the preschooler that likes to run, play, get into mischief, loves music, is not in love with organized sports, and would rather just be an explorer trying every new thing that comes into his awareness. The drawing and reading were requested by his parents because they had decided to name the baby after his paternal grandfather, a presence they felt around them very often since the mother, Lanny, became pregnant. While this message is rather short, some of the readings are several pages long with all kinds of requests and information the growing baby feels the parents need to know before the birth. Some babies have a name they want to be called, and are very upset if the parents are not on board with the name they feel is important. The drawings and readings certainly dismiss the idea that a baby is born an open page, with all emotional, spiritual, intellectual, and personality development beginning at birth. All names are changed to preserve privacy. Baby Markus is very quiet and peaceful. He seems to be a happy little guy looking forward to being in body. He is not always going to be quiet and peaceful. He will grow into quite a rambunctious toddler and be busy and productive. He looks forward to this life and he comes with a lot of plans. He feels he is getting another chance to live life, as he did not get through his plans last time and was disappointed with that. There have been many previous go-rounds with life – some happy, some tragic, some wounds that are still raw. He has a lot to give and share with the world. Right now, his memory is still open and flowing, and he has a lot of recall of his spiritual history. He is OK with this and do not be surprised if he comes into life with his memory bank open. You may notice references to things in the past or other telling things about soul history memory as he grows. Be open to the fact that he is speaking from his spiritual memory bank and not making up a lot of “stuff”. This should be an adventure for all. He’ll most likely be busy trying to do things and complete tasks his little mind and body aren’t ready for, but help him a bit and let him run with his ideas if he is safe. He is very smart. Diet and exercise are going to be very important for this baby and young boy as he grows. He is bringing some ideas (from his history) about what is good for him to eat and not good. He is going to have to watch his sugar and carb intake and if he does so, all should be well. He wants to be as healthy as he can be. He says he loves vegetables and good healthy organic foods. He does not want to eat junk, and probably never will want to. (That is his plan). He is into prevention as he wants this life to be long and happy. He likes color – yellow, orange, bright green, and blue. He likes that you are going to breast feed him. He thinks this gives him a better chance at a healthy life. This baby likes hugs in moderation. He’ll want to snuggle, but he’ll have his limits. He wants to always be close by, is not a fan of solitude. He is very intelligent and has some special gifts, some of which you’ll like and some which might challenge you. He likes activity, but might not like organized sports. He remembers that he used to like to fence. so, individual sports might be best. He reserves the right to change his mind once he gets here in his new body. He loves music, and if things hold true, he may write music and play music for a living. He has a diabolical sense of humor. From paternal Grandfather Markus, for whom the baby is named – I am around a lot. I am looking forward to the birth of this baby. I love that Lanny thought of my name for the baby . . . he is laughing because she had some help from spirit on this one. This baby is unique, special, and is going to need your love and support from day one. Yes, he comes pre-programed with some information that is really helpful for him. I hope you are OK with that. His soul history has had some rocky roads. And, he plans this life to be happy, wholesome, loving, and good. I’ll be at the birth, if that is OK with the two of you and I’ll bring his spirit family with me, so the room will be full. I might say that they are bringing me with them, although the spirit families have shared helpers as is true in all families. Be happy Conner and Lanny. I love you both very much. Lanny, you are good for my boy, (Conner), take good care of him. Love you both. From the paternal Grandmother – this is all a lot of nonsense, but I am not missing out. Love to all. Love to baby Markus. He is quite a character. I have gotten to know him on this side of the gate. He has a lot of plans for this life, so please support all his efforts as best as you can. He’ll want to start early to get everything done, and I know both of you will be OK with that. Markus is all over this birth. I’ll be around too, but I won’t make a nuisance of myself. You may or may not notice me. Since I’ve known Markus here, I am not as eager as your grandfather to see him, meet him, and be a part of the whole show! Love and care to you as you start your new family. This is a perfect scenario for both of you, and I know you will be good parents. Love you very much. Conner take good care of Lanny and this little man who is coming into your life. He is quite a gift! Pre-birth and immediately after birth, there is very little color in the Auragraph because the individual is just beginning to develop a history and a personality for this life. On the back of the drawing you will notice a collage of color. These are the memories from his last life and from his soul’s history, but mostly the most current life which he feels was cut short and not fulfilled in terms of his goals and dreams. You can kind of see the frustration in the collage in the way it is a mass rather than distinct information. You can also see the blue intellect, the green healing that has already taken place, and the pink of spirit and love that surrounds the other colors. This is a very special young man and one with great drive and great imagination that is coming into the Markus life. It will be fun sharing life with this dynamo of energy, ideas, and goals. Share the reason that you want the drawing, the questions you would like answered. Some folks what to simply see what comes up, and that is OK with me too. I may ask you to email a photo or any other information that I feel I need to complete the work. What I need differs from individual to individual. If we have spiritual permission to create the drawing and reading, I’ll complete the drawing and the interpretive reading. I’ll email you a photo of the drawing and the written interpretation. 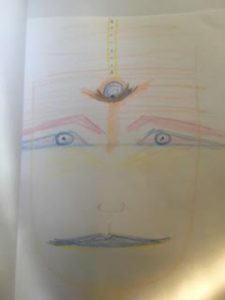 We set an appointment for a phone call discussion of the aura drawing and I’ll answer any questions you have about the written content I’ve sent you. I’ll also answer any other questions that might come up during our phone call or Skype call. Once our call is complete, I’ll mail you the original drawing. The mailing charge is included in the total cost, unless the drawing is going out of the United States – in these cases, the cost of postage may be added. The cost is usually between $125 and $175 depending on the length of time I spend completing the work. It can take as long as 5 hours to complete a drawing and reading for you, plus the time of the call. I do not charge by the hour for this service, but I do slightly increase charges for very lengthy readings or phone calls.